40 year old male who had h/o migraine presented with migraine followed by defective vision.On examination he had left homonymous hemianopia with normal fundus.MRI showed infarct in right PCA territory. 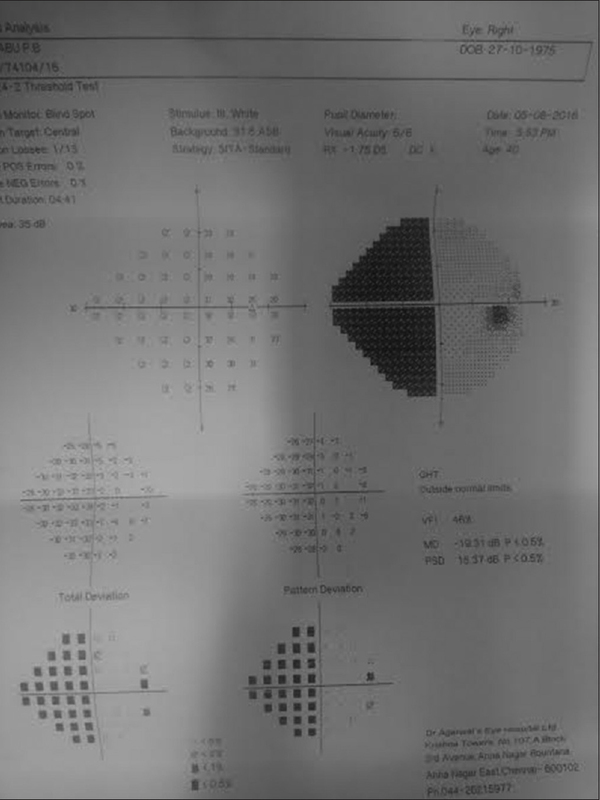 Neurologist opinion obtained and a diagnosed to be migrainous infarction.Since ophthalmologist may be the first person to see such patients high index of suspicion and prompt treatment is essential. He had a history of migraine for 15 years, usually associated with visual aura (scintillating light with or without visual disturbance). Aura will last for few minutes followed by a severe headache. During the episode, the patient takes flunarizine and paracetamol after which symptoms subside. This time, it lasted for more than 1 day; hence, he consulted the ophthalmologist. There was no complaint of diplopia, slurred speech, or weakness of limbs. There was a history of systemic hypertension for 2 years on medication. On examination, pulse was 82/min, blood pressure was 140/90 mmHg, EOM full; and vision: Right eye 6/6 and left eye 6/6. Slit lamp examination was normal. Fundus examination was found to be normal. 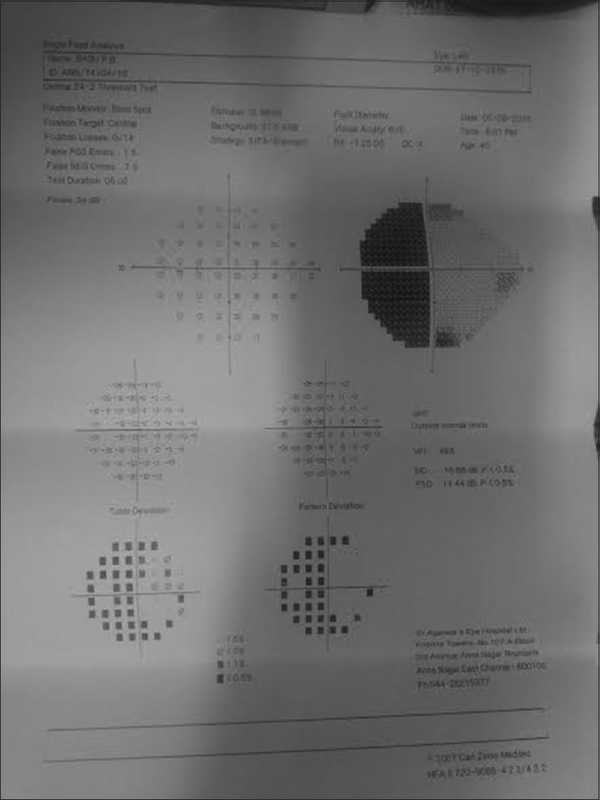 Visual fields showed left homonymous hemianopia [Figure 3] and [Figure 4]. The patient was referred to a neurologist for complete neurological evaluation. Echocardiogram and electrocardiogram were normal. Vasculitis and thrombophilia workup were normal. 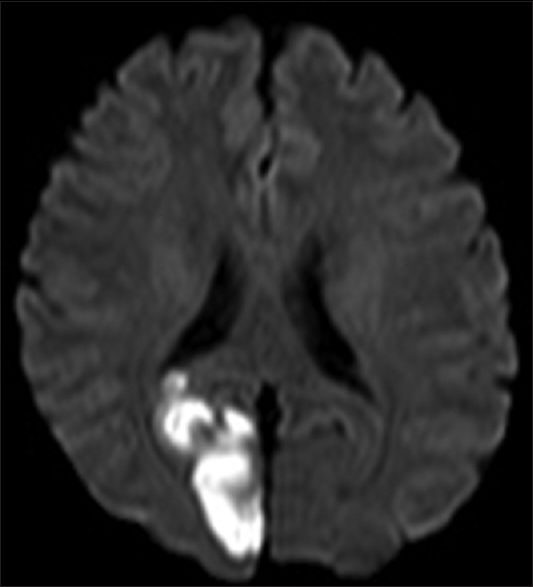 Magnetic resonance imaging (MRI) showed medium-sized acute infarct in the right posterior cerebral artery territory [Figure 1] and [Figure 2]. The patient was diagnosed to have migrainous infarction. On neurologist's advice, he was treated with intravenous fluids, antihypertensive drugs, and neuroprotectives. When cerebral infarction occurs during typical migraine aura attack, the term migrainous infarction is used. The relationship between migraine with aura and ischemic stroke has been well recognized. In fact, migraine generally a benign condition can be an independent risk factor for stroke. The mechanism of migrainous infarction is complex. It remains to be determined whether the relationship between migraine and stroke is a consequence of other underlying condition or the presence of similar ischemic risk factor. Migrainous infarction occurs in the posterior circulation., Differentiation between migrainous infarction and prolonged aura is difficult and associated with delayed admission. Ophthalmologist may be the first person to see such patient. A high index of suspicion and prompt MRI establishes diagnosis. Triptans, ergots, and dihydroergotamine are contraindicated. Agostoni E, Aliprandi A. The complications of migraine with aura. Neurol Sci 2006;27 Suppl 2:S91-5. Wolf ME, Szabo K, Griebe M, Förster A, Gass A, Hennerici MG, et al. 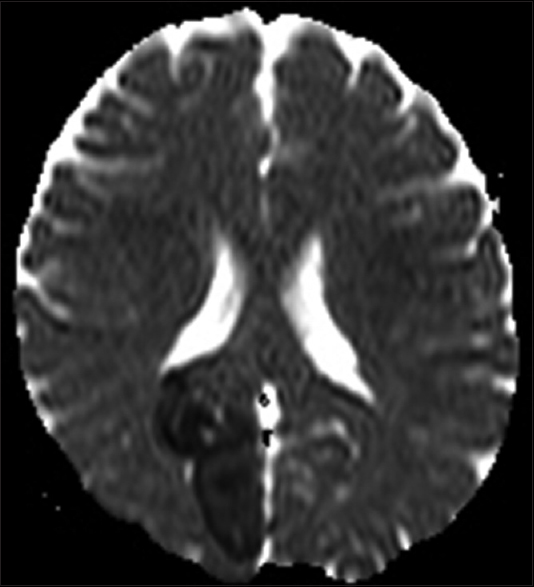 Clinical and MRI characteristics of acute migrainous infarction. Neurology 2011;76:1911-7. Laurell K, Artto V, Bendtsen L, Hagen K, Kallela M, Meyer EL, et al. Migrainous infarction: A Nordic multicenter study. Eur J Neurol 2011;18:1220-6.